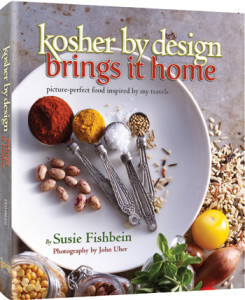 Kosher by Design Brings It Home is Susie’s final installment in the Kosher by Design cookbook series. Fifteen years ago Susie Fishbein set out to bring a sense of elegance and beauty to kosher cooking. Creating innovative recipes for holidays as well as every day meals, to unique table settings and floral arrangements, the Kosher by Design cookbook series was born. With over 500,000 copies sold, Susie is the definitive voice in kosher cooking and her books are THE go-to resources for home cooks who want delicious and creative kosher meals. Now, with her final installment in the Kosher by Design cookbook series, Susie presents fresh and exciting new recipes culled from her 15-year culinary journey. 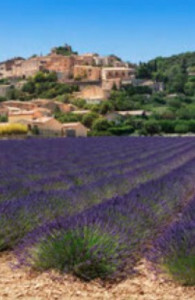 Kosher by Design Brings It Home offers 115 tempting international recipes accompanied by magnificent full-color photos. Along with many poignant stories gleaned from her cooking demos, Susie shares the tantalizingly delicious recipes learned from the great chefs she encountered in Italy, France, Mexico, Israel, and across North America. Travel with Susie as she brings cross-cultural culinary experiences to your kitchen with Kosher by Design Brings It Home, her superlative conclusion to the cookbooks that elevated kosher cooking to world-class taste and presentation. Susie Fishbein is a world-famous kosher cook and author. Her acclaimed Kosher by Design series (including Kosher by Design Entertaining, Short on Time, Kids in the Kitchen, Passover by Design, Cooking Coach) has sold over 500,000 copies worldwide and has led to hundreds of personal appearances from coast to coast and abroad. 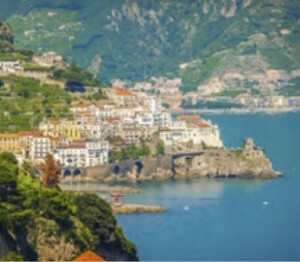 Susie has been the featured celebrity guest on cruise ships as well as at culinary adventures in France, Italy, Israel, and Mexico. Profiled in The New York Times and on CNN, Susie has been named one of the 50 most influential Jews by The Forward. A media favorite she has been a guest on scores of network TV and radio shows such as NBC’s Today and Martha Stewart Radio. Susie was featured at the Epcot International Food and Wine Festival at Disneyworld, and taught at New York’s De Gustibus cooking school, as well as a featured celebrity teacher on cruise ships. In recognition of National Jewish Heritage Month, Susie was an honored guest at the White House. She annually leads international culinary tours. She lives with her family in New Jersey. 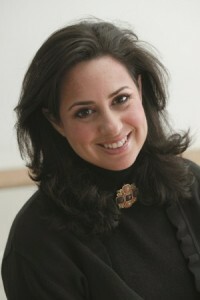 For more information on Susie and the Kosher by Design series, visit www.KosherbyDesign.com. wanted to use as many Middle Eastern ingredients as possible, to whet the appetites of the participants for what they would experience in the upcoming days. 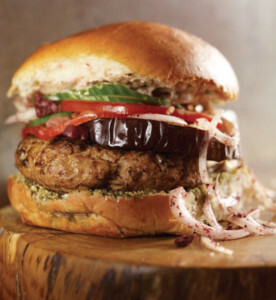 The chickpeas in the burger, the crunch of the sumac onions, the creaminess of the techina, the hit of za’atar in the olive oil, the crisp grilled eggplant: this one rang every bell. You will LOVE it! Place the chickpeas into a large bowl. Using a potato masher, mash the chickpeas. Add the ground beef and shawarma spice. Mix well to combine. Divide and shape into 4 burgers. Slice the eggplant into 4 (½-inch-thick) slices, the same diameter as the burgers. Place into a bowl; drizzle with olive oil and kosher salt. Rub the oil in; allow to tenderize for a few minutes. Place the onion slices into a small bowl. Toss with the sumac and 2 teaspoons olive oil. Set aside. In a small bowl or ramekin, combine the za’atar with 1 tablespoon olive oil. Coat a nonstick grill pan with nonstick cooking spray. Heat the pan until very hot but not smoking. Grill the eggplant, trying not to move it around so you get nice grill marks on both sides. Remove to a platter; set aside. Re-spray the pan; sear the burgers, 6-7 minutes per side. Assemble the burgers: Spread ½ teaspoon techina on one side of the bun and spread a little of the za’atar mix on the other side. Place a burger on the bottom half of a bun. Top with eggplant slice, tomato, cucum-ber, sumac onions, and olives. Top with second half of bun. Repeat with remaining burgers and buns.